Orchid trees are named for their absolutely breathtaking, orchid-like flowers. A few weeks ago our local orchid trees were masses of brilliant flowers. Orchid trees were originally from Asia, but are now grown in warm areas throughout the world. The trees can withstand a light frost, but are killed by colder temperatures. 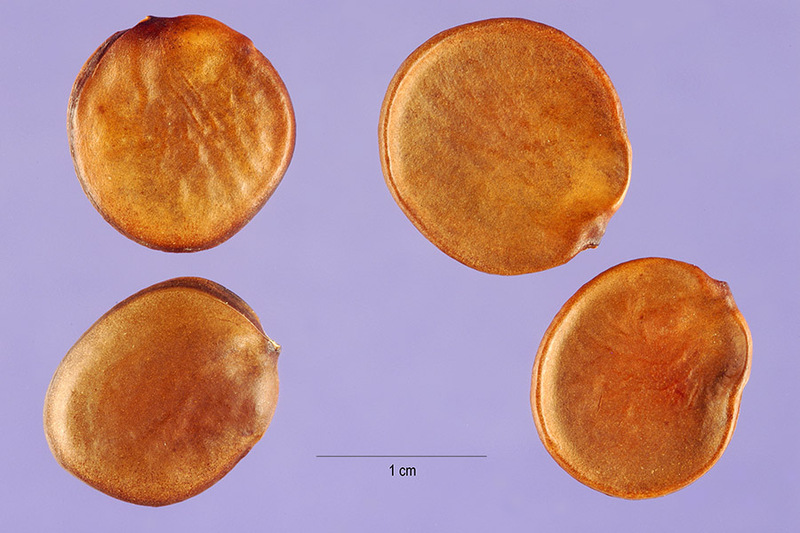 The pods and seeds in the mystery seed post most likely were from Bauhinia variegata, which is also called "mountain ebony." 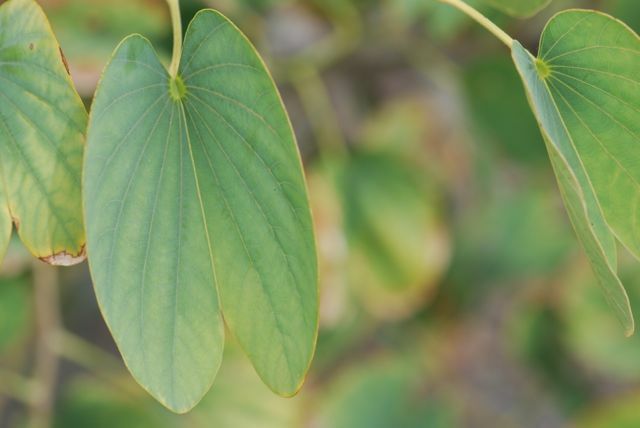 Unlike the immature green mystery seeds, Bauhinia variegata seeds are light brown when mature. 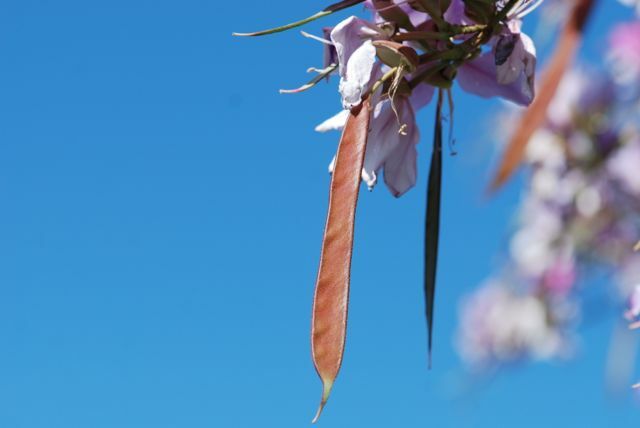 Orchid trees are easy to identify when they are not in bloom because they have unusual bi-lobed leaves. 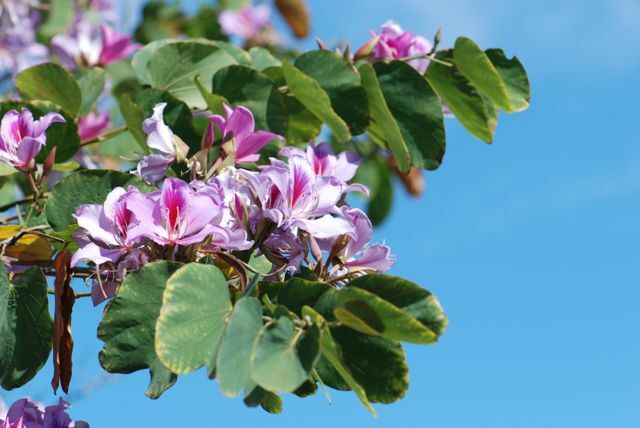 Another type of orchid tree that grows in Arizona is the Hong Kong orchid tree, Bauhinia blakeana. 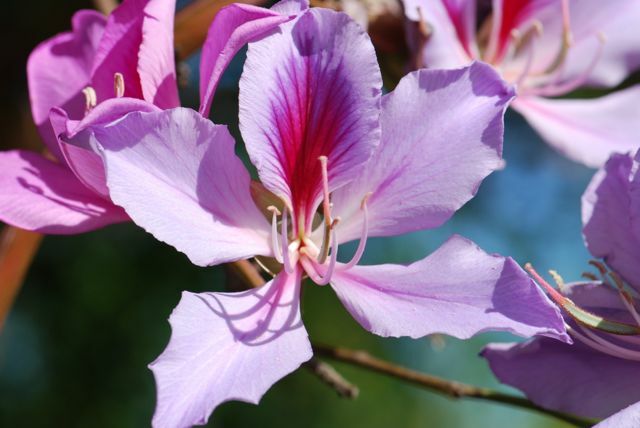 The Hong Kong orchid tree is actually a hybrid and does not produce seeds. 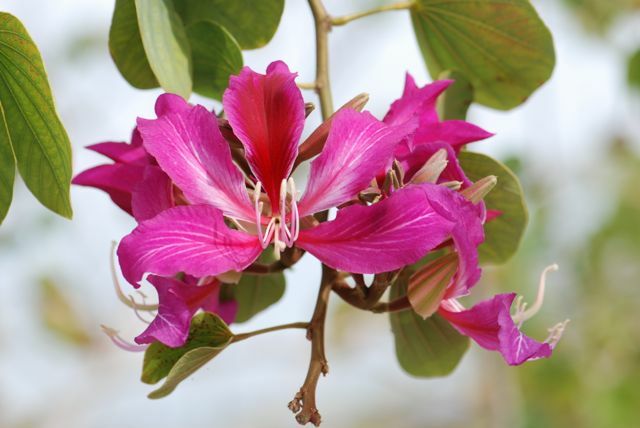 Hong Kong orchid trees have darker magenta or reddish purple flowers. Given the long stamens and pistil of the orchid tree flowers, it is not surprising to learn that they are often pollinated by large moths (see pollination by butterflies post for more information). Have you every seen an orchid tree in full bloom? Aren't they amazing? I have a great big mountain ebony tree. I just pulled a bag full of the seed pods. Some were dry and some were green. Will the green ones dry ok and what's the best way to dry them? I'm not sure. Readers have any ideas? I'll check with a botanist friend, too. Orchid trees do okay here in the desert, but they take quite a bit of water, about as much as a lawn would. The cold seems to effect them more than the heat, because they are pretty frost sensitive. Also, they have low tolerance for salts in the water, but if you're getting a lot of rain that shouldn't be a problem. I have been given some orchid tree seeds . Orchid trees will germinate in regular potting soil. Soaking them by wrapping in moist paper towels and sealing in a plastic bag for 24 hours might increase germination. Try half with soaking and half without, if you'd like. Depending on where you live, the seedlings can be transplanted outside in the ground when the weather warms up. I noticed ours here in Arizona were flowering last week, but it is pretty cold for them this week. I just got a Hong Kong Orchid tree it had seed pods that are approximately 6 to 7 inches bright green, are these pods sterile? I will I know? 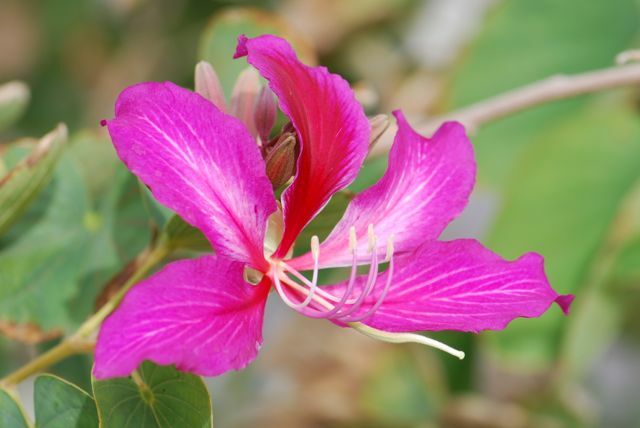 Because the Hong Kong orchid tree is a hybrid cross, it is usually sterile. However, nature has a way of making exceptions. Look to see if seeds are forming and maturing within the pods (you can see what they look like in the post). If the pods do produce mature seeds, then it might be worthwhile to try germinating them. I just planted a Hong Kong orchid tree in Zone 9 Arizona desert. It is doing well. My question is can I remove the long seed pods that are growing and when is it best to remove them. I don't care for the way they look and I'm not interested in germinating the seeds. But I don't want to negatively impact future blooms. Thank you. Removing the seed pods should have no impact on future blooms as long as that's all you remove. Just make sure not to disturb the buds.